In August of 2008 a study was initiated to compare the long-term integrity of blown stabilized fiberglass insulation to traditional blown cellulose insulation (Figure 1). 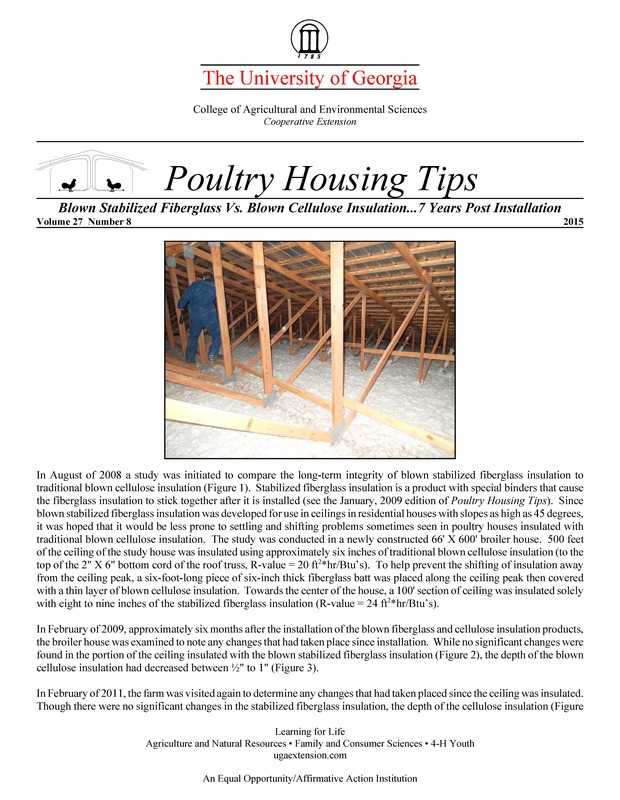 Stabilized fiberglass insulation is a product with special binders that cause the fiberglass insulation to stick together after it is installed (see the January, 2009 edition of Poultry Housing Tips). Since blown stabilized fiberglass insulation was developed for use in ceilings in residential houses with slopes as high as 45 degrees, it was hoped that it would be less prone to settling and shifting problems sometimes seen in poultry houses insulated with traditional blown cellulose insulation. The study was conducted in a newly constructed 66' X 600' broiler house. 500 feet of the ceiling of the study house was insulated using approximately six inches of traditional blown cellulose insulation (to the top of the 2" X 6" bottom cord of the roof truss, R-value = 20 ft2*hr/Btu’s). To help prevent the shifting of insulation away from the ceiling peak, a six-foot-long piece of six-inch thick fiberglass batt was placed along the ceiling peak then covered with a thin layer of blown cellulose insulation. Towards the center of the house, a 100' section of ceiling was insulated solely with eight to nine inches of the stabilized fiberglass insulation (R-value = 24 ft2*hr/Btu’s). In February of 2009, approximately six months after the installation of the blown fiberglass and cellulose insulation products, the broiler house was examined to note any changes that had taken place since installation. While no significant changes were found in the portion of the ceiling insulated with the blown stabilized fiberglass insulation (Figure 2), the depth of the blown cellulose insulation had decreased between ½" to 1" (Figure 3). In February of 2011, the farm was visited again to determine any changes that had taken placed since the ceiling was insulated. Though there were no significant changes in the stabilized fiberglass insulation, the depth of the cellulose insulation (Figure 4) had decreased on average between 1" and 2" (Figure 5) and approximately 3" near the eaves compared to initial installation measurements. It is important to note that what appears to be settling near the eaves may be in part due to the movement of insulation caused by increased air velocities that generally occur in this area of the attic on windy days, and the fact that the original insulation depth was slightly less due to difficulties involved in blowing insulation near the eaves of a house. Bottom line, after 2 ½ years what was originally a ceiling with a R-value of 20 ft2*hr/Btu’s (5 ½" blown cellulose) had decreased to a ceiling with a R-value of 15 ft2*hr/Btu’s (4" blown cellulose). In November of 2015, approximately seven years post installation, the condition of insulation products was again evaluated (Figures 6,7,8, and 9). Though there was no appreciable change in the overall depth of the stabilized fiberglass insulation, there was further reduction in the depth of the blown cellulose insulation. Random measurements found that the depth of the cellulose insulation was to between 2 ½" and 3", roughly half the original depth. As observed during previous visits, the depth in some locations near the eaves was significantly less due to wind blowing into the attic at the eaves of the house. It was observed that there was a slight reduction in depth, approximately one inch, of the stabilized fiberglass insulation directly under the ridge likely due to rain occasionally being blown into the attic through the partially open ridge cap and wetting the insulation. There were no signs of either type of insulation moving away from the peak of ceiling. The results of this study to this point confirm the U.S. Department of Energy (DOE) recommendation that when using blown cellulose insulation, installers should take into account the fact that the insulation will settle. Whereas in typical residential installations, cellulose insulation is expected to settle 20% over time (compared to 2 to 4 percent for fiberglass) it appears that in poultry house applications cellulose insulation may settle 40 - 50%, over the long term resulting in roughly a 50% reduction in insulating ability. The increased settling observed in poultry houses is like due in part to the movement of “woven-poly” dropped ceilings as fans turn on and off. If a dropped ceiling is constructed of a rigid material (i.e., sheet metal, plywood) it is likely the settling would possibly be similar to that indicated by the DOE. It is important to note that a reduction in ceiling R-value from 21 ft2*hr/Btu’s to approximately 10 ft2*hr/Btu’s though significant, doesn’t mean that heating costs will double. The heat loss through the ceiling in a typical poultry house only accounts for between 10 and 30% of a house’s total heating cost. Factors such as ventilation rates and house tightness typically play a more substantial part in determining a house’s heating cost. In this particular case the reduction in ceiling R-value will likely result in an increased heating costs of roughly 15%. The results of this field study indicate that for long-term insulating ability poultry producers may want to consider either stabilized fiberglass or fiberglass batts to insulate their dropped ceilings. If blown cellulose is used, producers may want to considering increasing the depth of insulation installed or plan on possibly adding insulation five to ten years post installation in order to keep heating costs to a minimum.